In the movie Wall Street, one dimension of the main character Gordon Gecko that the film disappointingly fails to explore is his love of the outdoors. That’s right, he loves to go camping. Unexpected, right? Gordon’s never going to get a data connection out there, but with a bit of Python and Twilio SMS he can still check his stock prices with only a few of those precious reception bars. Let’s find out how. For this simple app all you need is a Twilio account and a Python development environment. If you are new to Python it’s easy to set up sign up for a free trial. Next define a new route that Twilio can request via an HTTP POST when it receives an inbound text message. That route creates a response that containing the TwiML <Message> verb which tells Twilio to send an SMS message back to the sender. The app will start and expose the sms route on http://localhost:5000. Test the route using an HTTP client like cURL or Postman to make a request to the sms route. The response should contain the generated TwiML. High five! With the route generating TwiML let’s modify it to let someone request the the price of a specific listing by texting in a stock symbol. Restart the app and head back to your HTTP client to make a request to the sms route again this time including the form-encoded Body parameter. With the app running the final step is to connect a Twilio phone number to it. Twilio uses an HTTP request to a public URL to tell us that it has received an incoming SMS message. We can expose the Python app running in own local environment via a public URL by using ngrok. Next, head over to the Phone Numbers section of the Twilio Console to select an existing number in your account buy a new number. Save the phone number and give your app a try by texting your favorite stock symbol to your Twilio phone number. Boom! Quick stock symbol info on your phone via single simple SMS message. 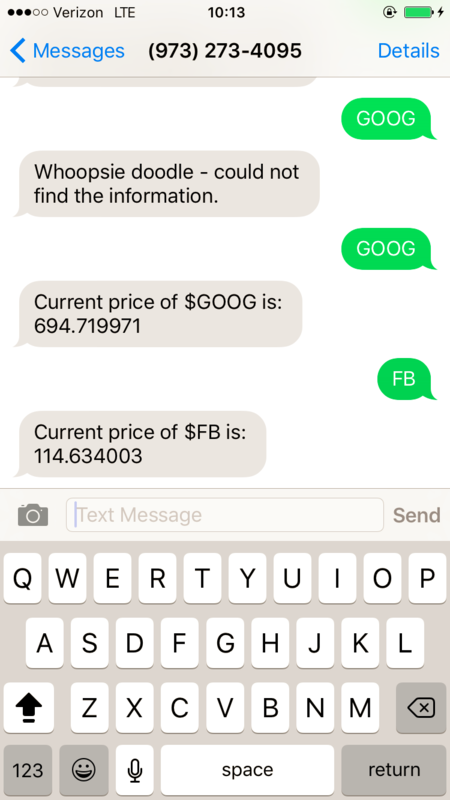 By combining a few bits of Python and Twilio, in just a few minutes we were able to build a really fun and useful SMS app. But the fun does not have to stop there. The app could be made even more useful by allowing the user to request prices of multiple stocks or by using a task queue library like Celery to allow the user to set up SMS notifications for when a symbol hits a price threshold. Let me know what you’re building with Python or Twilio. Shoot me a tweet @devinrader.